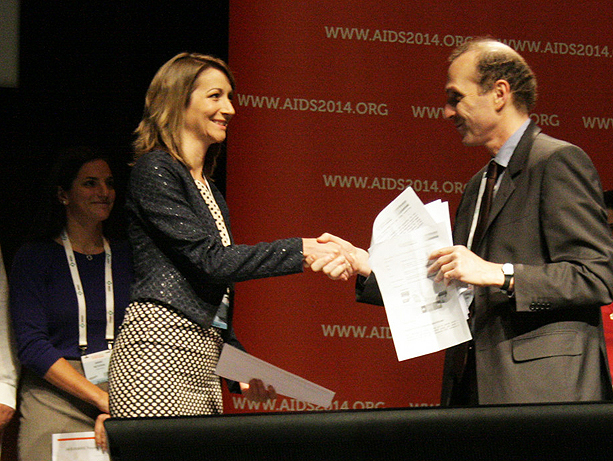 In July, UW graduate Jillian Pintye accepted a prestigious Young Investigator Award at the 20th International AIDS Conference. Pintye, who studied epidemiology and global health in the School of Public Health, won for her research finding that male circumcision decreases acquisition of syphilis among male and female partners of HIV-1 serodiscordant heterosexual couples in Africa. Pintye is now a Ph.D. student at UW's School of Nursing. HSNewsBeat wanted to know more about her career path so far. Q. When did you become interested in global health? A. During my bachelor’s in nursing program at La Salle University, I had the opportunity to do health assessments on kids in rural areas of Vietnam and Guatemala. These kids didn’t have access to primary care but they had Pepsi. That was my introduction to global health inequity -- sort of my aha moment. Q. What happened after you graduated? Pintye demonstrates a condom's strength at a refugee camp in Botswana. A. I received a Fulbright grant to study public health with a research team at the University of Southern Denmark. I also volunteered with Iraqi and Palestinian refugees. I was able to see how humanitarian assistance was delivered and how we can promote health equity through policies and programs. Q. How did you end up in Botswana? A. While I lived in Scandinavia, I applied to the Peace Corps and told the the recruiter I wanted to go somewhere warm. They assigned me to work on HIV-related issues in sub-Saharan Africa. I did a certificate course in tropical medicine and six months after my Fulbright, I went to Botswana, which at the time had the second-highest HIV prevalence in the world: One in four adults was living with HIV. The prevalence was even higher among women. Q. What was a challenge in reducing that epidemic where you worked? A. Botswana has many national HIV programs but at the time, most were exclusively accessible only to Botswana citizens. Our district had the only refugee camp in the country and most camp residents couldn’t access the standard national programs, as citizens could. We worked to build a program that could meet the needs of our community. Q. Why did you want to study epidemiology? A. In Botswana, there were so many things I wish I knew how to do with our team. For example, how to deal with missing numbers on clinic forms or generate a representative sample for a household survey. Epidemiology provides the practical analytic skills I needed to take my research to the next level. Q. How did you get involved in a syphilis study? Pintye with a friend in Botswana. Q. What interested you about this study? A. I was interested in male circumcision because while I was in Botswana, the national Safe Male Circumcision campaign rolled out. At the time, there was a big discussion on whether circumcising HIV-infected men would be beneficial. Q. What are your plans after getting a doctoral degree in nursing? A. I would like to stay in HIV and STI research in a capacity that strengthens delivery of prevention programs. I would also like to support strengthening collaboration between schools of nursing in the United States and abroad to promote global nursing research. Q. Anything else you’d like to share? A. The research mentorship I receive at UW provides an invaluable learning experience. It’s incredible to have such a high level of support from the world class faculty and researchers. Working with mentors that are so passionate about global health issues and can create such rich experiences for their students is truly inspiring.